San Miguel de Allende is a lovely colonial town located in the state of Guanajuato northwest of Mexico City, in an arid and mountainous region that never gets too hot or too cold. It is famous for its beautiful architecture, especially the exquisite cathedral called La Parroquia, and the many traditional Mexican fiestas that are celebrated here, including splendid fireworks, music, dancing, and parades. 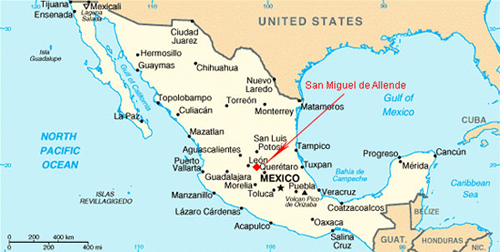 San Miguel is serviced by the Leon Airport an hour and a half away, and Mexico City airport, three hours away by bus. Bici-Burro is located just a couple of blocks up a hill from the main plaza of San Miguel, at Calle Hospicio #1.